Revealing the science behind the lats… a simple but effective understanding of why and how you can train right to achieve a full, wide back. The lats, (Latissimus dorsi) are the largest muscles on the back. They provide the V-taper physique that everyone desires; taking an average physiq ue, to a special one. However, they are also crucial in stabilising the shoulder joint. This will prevent shoulder injury, and keep your shoulder safe during pressing exercises, such as the bench press. Additionally, it can contribute towards a healthy posture. What I often see in the gym is people not knowing how to optimally train their lats or what gym equipment to use, or rather doing a random upper body workout that doesn’t target muscles properly. I’ve seen people perform dumbbell sets from all different angles, jumping on and off a weight bench, to using every rowing machine and performing every form of lat pulldown, displaying little knowledge of efficient lat exercises. – Cable seated row, etc. As you can see by this picture, the muscle fibres of the lats run at a diagonal angle, and originate in the humerus – the upper arm bone. The muscle fibres insert to the middle and lower portions of the vertebrae. In order to develop the muscle, the origin point must be brought closer to the insertion point, along the angle of the muscle fibres. Since the lats are a large muscle group, specific exercises need to be performed in order to target the muscle fibres at an optimal level. The chin up can be performed on a pull up bar, with the arms at shoulder width apart. This exercise is very versatile as gym equipment is not necessarily needed. Bars are available to buy and attach to the top of a door frame allowing you to practice chin ups at home. The lat pulldown with supinated wrists can be performed on a lat pulldown machine, with a regular lat pulldown bar. Again, the arms are placed at at least shoulder width apart. This allows the shoulders to remain in a safe position of external rotation, and to keep the chest up, and prevent it from collapsing during the motion of the exercise. 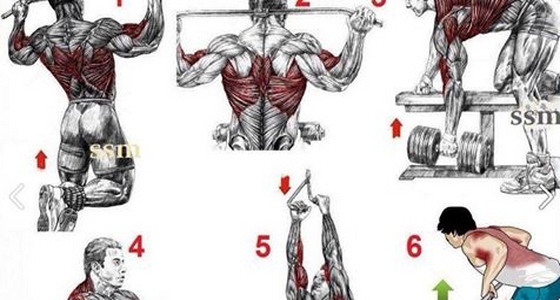 Lat exercise sets should finish with a type of shoulder adduction for the best effectiveness. Referring to the angle of which the muscle fibres run along the back, we can determine the angle at which we should perform rowing exercises. I suggest performing an isolation exercise such as the single arm row using a cable machine to allow constant tension to be placed upon the lat muscle, thus leading to greater muscle gains. The cable will be best set at a height of approximately forehead level and should be pulled to the upper part of the abdominals. This may be best performed seated on a bench in order to improve stabilisation when the weight gets heavy. As this is an isolation exercise, the body should remain somewhat stationary, ensuring maximum tension is being placed on only the lat muscle. Building lats: how many sets and reps? 2 sets of chin-ups/pulldown with supinated wrist: 6-10 reps.
1 set of single arm row, using the cable machine: 8-12 reps. I train heavier on the first exercise, whilst solely focusing on muscular contraction of the lats when performing the isolation exercise of the cable row. The most important factor when training is adding weight when you can perform the current weight with ease. This will allow for constant progression and muscle gains. Thank you for reading! I hope you apply this knowledge to your training, so you can achieve massively developed lats.